Strip Doors Curtains or PVC Strip Curtains are made out of overlapping pvc strips mounted at the door openings, where the use of solid door made out of wood or metal is a concern because of high traffic. This scenario usually happens at the door entrances of store houses, ware houses, cold storages, food processing and storage units, where humans and machines move in and out constantly. In recent times there is a growing concern in conservation of energy all over the world, though there is a lot of option for energy saving, PVC strip doors has gained much significance because they are the most economical and maintenance free. 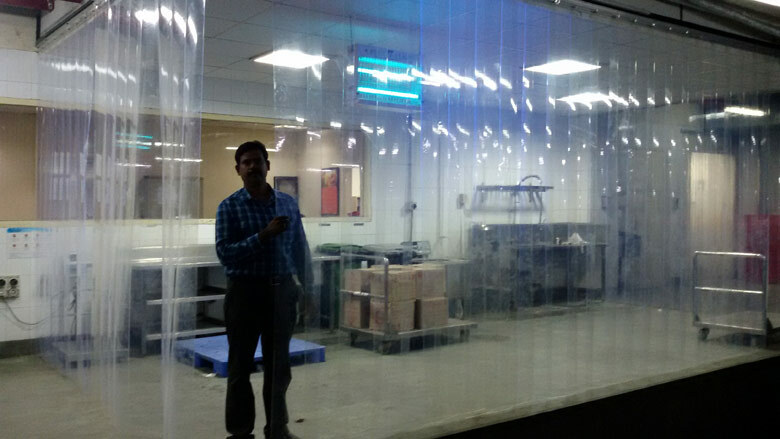 Strip doors and strip curtains are widely used in industrial and commercial applications like walk-in coolers and freezers, conveyor openings, loading docks, forklift access ways, noise reduction, clean rooms, organizing interior partitions, protection from harsh weather conditions and in noise control around heavy machineries. We have a wide range of strip doors and strip curtains installations for various applications from pharmaceutical plants, dairies and bottling plants, hospitals, concert halls and supermarkets. Strip doors and strip curtains are the most economical and excellent noise barriers, creating a stress free and peaceful working ambience for the workers. They help in saving energy by preventing heat loss or cold loss, thus enhancing the energy conservation thereby proving beneficial to the consumer and our environment. They also prevent dust and other air borne pollutants and toxic fumes from spreading from one work section to another. They are flexible and flame retardant which is safe around highly flammable materials and helps in preventing fire hazards. Strip doors and curtains are very easy to install, very low maintenance and repairing costs. They are dynamic and can be adapted to a wide range of applications. Strip doors and curtains help in solving the visibility problems at doorways. Also available colored PVC strip curtains that can be used as markers at entrances and restricted areas. We are the leading Strip door curtains and strip door dealers in Chennai, India.